Apple stock is surprisingly cheap, even if its growth is bound to slow down soon. On Tuesday morning, Apple (NASDAQ:AAPL) shares opened at an all-time high above $134, following the company's solid Q2 earnings beat on Monday. Boy, does that already seem like ancient history! 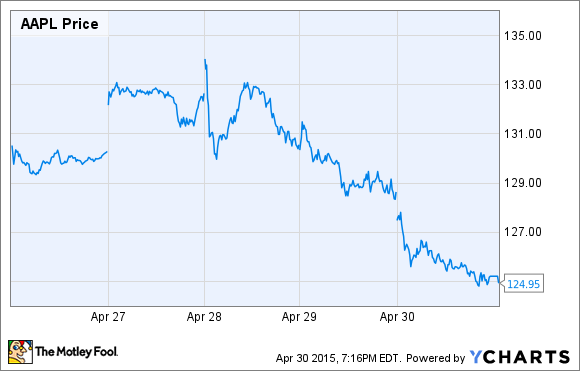 By the end of the day on Thursday, Apple stock had fallen 7% from its high to around $125. It's hard to know why Apple stock has dropped so far, so fast, even considering that the stock market as a whole had a rough week. There wasn't much to dislike in Apple's quarterly report, although some analysts have mused about surprising changes in warranty accruals that may have boosted Apple's Q2 profit. The good news for Apple investors is that they don't need to worry about these inexplicable day-to-day fluctuations. As long as Apple keeps growing its earnings, Apple stock will keep moving higher -- eventually. And Apple's profit outlook seems very solid, at least for the next couple of years. Meanwhile, combined sales of Apple's other products declined on a year-over-year basis. As a result, the iPhone accounted for 69.4% of Apple's revenue. Furthermore, the iPhone is more profitable than most of Apple's products, so it must have contributed an even higher proportion of Apple's profit. Can iPhone sales stay strong? Perhaps the biggest fear for most Apple investors -- and a key argument made by Apple bears -- is that iPhone sales could be peaking. The main rationale behind this line of thinking is that Apple's foray into big-screen phones with the iPhone 6 and iPhone 6 Plus ignited a huge upgrade cycle while attracting new users to the iOS ecosystem. But this strong cycle will cool in the next six months, and Apple will be unable to grow in the face of tough comparisons next year. However, Apple CEO Tim Cook told investors on the earnings call that only "about 20% of the active installed base" had upgraded to the latest iPhones as of the end of last quarter. Even if he was rounding down, it is clear that there are a massive number of people still using older iPhones -- 300 million seems like a reasonable ballpark estimate. Based on Apple's stellar customer satisfaction scores and customer retention history, it's almost a given that the vast majority of these users will upgrade their iPhones eventually. Between this big pool of replacement demand and the steady stream of Android-switchers and first-time smartphone buyers, the odds of Apple growing iPhone sales again next year -- albeit at a much slower rate -- are quite good. While the iPhone will naturally attract the lion's share of analyst and investor attention, Apple's other product lines could actually be a bigger factor in Apple's growth over the next few years. Apple's non-iPhone revenue has contracted this year, creating a drag on companywide revenue growth. This can be blamed entirely on the iPad: iPad revenue has declined by more than 20% year over year in each of the past two quarters. But the iPad sales slide is likely to slow or reverse next year -- if for no other reason than because it will be facing very easy comparisons to FY15. While a $10 billion Apple Watch business would represent a small part of Apple's total revenue base, it could still contribute a few percentage points to Apple's overall growth. As long as all of Apple's other major product lines are growing -- if only modestly -- that should add up to a solid year of revenue and earnings growth. Apple is on pace to deliver 25%-30% revenue growth in FY15. It seems very unlikely that Apple would be able to grow at anything close to that rate in FY16 -- but it doesn't need to for Apple stock to move higher. If Apple can achieve just high single-digit revenue growth next year, it should quell a lot of the worries about its recent performance being a flash in the pan and boost Apple stock. Between modest iPhone sales growth, a return to growth in the rest of its existing business, and the first full year of Apple Watch sales, that goal seems very achievable.